Alison’s story: What did I learn as a corporate buddy? While working at Savills, Alison attended an information session hosted by Back Up. This inspired her to attend Back Up’s Edinburgh City Skills courses as a corporate buddy. Our corporate buddies are volunteers who have been sponsored by their employer to help out on Back Up’s residential courses. They support and encourage our teams of participants, help our courses run smoothly, and are all-round fantastic people! 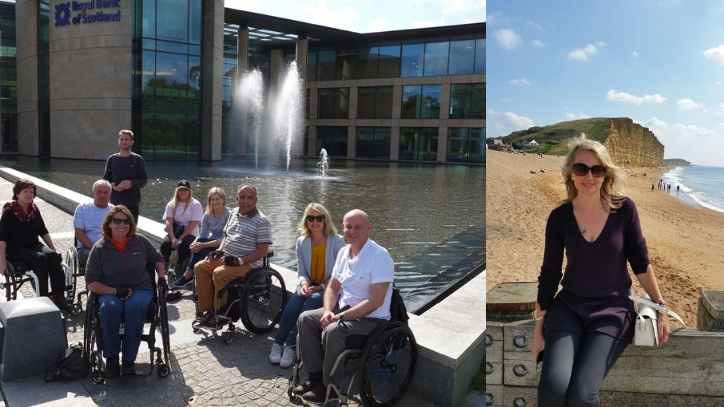 Alison spent six days volunteering on the course in Edinburgh helping participants learn new skills. This included back wheel balancing, tackling kerbs, and navigating public transport. Although it was challenging at times, Alison found volunteering in Edinburgh interesting and rewarding. She learned a lot about how much planning and consideration it can take for a wheelchair user to travel across a busy city. 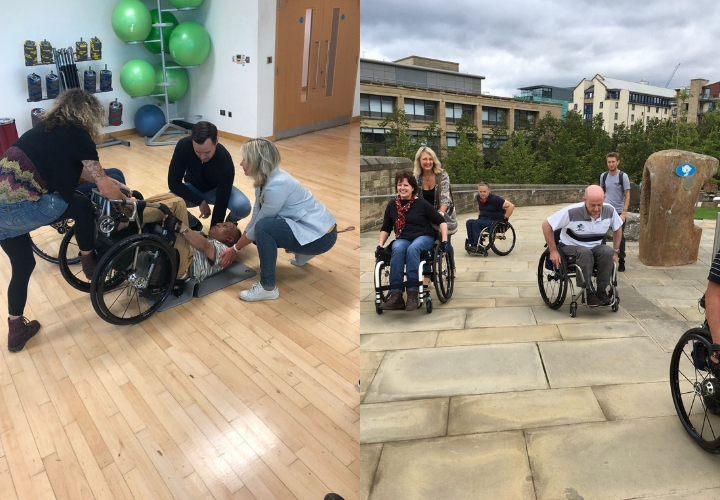 The Edinburgh City Skills course allowed Alison to understand how these big adjustments can make life feel overwhelming for someone who’s newly injured. She also learned the valuable lesson that it can be easy to make assumptions about disability, but there is always more to someone’s story. Alison also found it wonderful to get to know the people we support and experience Edinburgh with them. She was able to leave the course with a newfound passion for volunteering and plenty of happy memories. “The six days were excellent. We got to know everybody very well. It was a beautiful city to explore, and all the people were lovely too. After coming back from the course, Alison and a co-worker with a spinal cord injury went out for lunch. Alison says that the Edinburgh City Skills course gave her the confidence to connect with him, as she was previously concerned that she might say the wrong thing and cause offence. “I said, ‘let’s have lunch together,’ so I could get to know him a bit more. If I hadn’t have done the course, I wouldn’t have suggested that. It’s made me less afraid of talking, and less worried about saying the wrong thing”. By donating her time and effort, Alison helped our participants get as much as possible out of the course. If you or your company are interested in our corporate volunteer opportunities, please drop Tim an email or call him on 020 8875 1805.